Heating with induction is an innovative method which has proven itself in numerous industries for numerous manufacturing processes. Why? the answer is: induction heating is an efficient, effective, repeatable, non contact and safe process - perfect for fastener heating. Now, there are many ways to implement it into a manufacturing process. But what can Ambrell do for fastener manufacturers? Let's find out. Induction is used for preheating bolt and screw heads prior to forging. Benefits of pre-heating with induction are: consistency, quality, increased productivity and lower footprint through energy savings. Thread rolling – using a thread roll die to form a thread into a heated fastener – has gained popularity over thread cutting. Thread rolling pushes the material into shape against a threadroll die rather than cutting, which reduces material waste and stress to the fastener. Precision heating, higher quality of the fastener and increased efficiency are benefits of using induction for thread rolling. Induction heating is ideal for curing the paint or powder material used in thread patching. Rapid heating to temperature, controllablity and the high quality process advocate for induction curing process. At Ambrell, we understand our customers' needs. Whether you need a more efficient heating solution or process improvement - we make it measurable. Ambrell offers outstanding service and expertise that go way beyond the sale process. Take a look at our complimentary lab testing service and find out how induction heating can maximize the efficiency of your process. We've shared more insights on induction heating applications in our rich application note library. 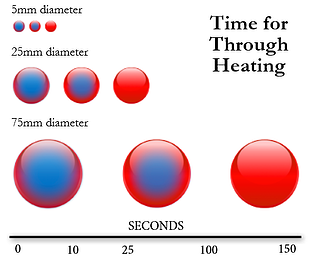 Read more and let us know if you have any questions about your fastener heating process!